The PROGRESS Kick-off meeting was held at “le Commissariat à l’énergie atomique et aux énergies alternatives” (CEA) in Gramat, France. 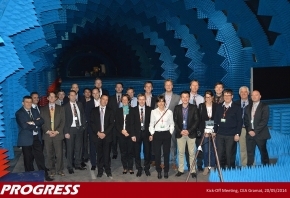 The consortium members were joined by representatives of the European Commission. Management structures, procedures and rules were discussed and agreed. Co-operation to meet the first technical deadlines in the project were also agreed, mainly in connection with the development of the generic system architecture to be used in connection with the work on threat analysis and risk assessment.